CEO Fabian Siegel explained: “This current round provides us sufficient capital to fuel our aggressive international growth plans”. The new round brings in Kreos Capital and existing investors to double the amount of funds sunk in the company. Previous funding rounds included Ru-Net, Tengelmann Ventures, Kite Ventures, Holtzbrinck Ventures, Point Nine Capital and Team Europe (also a shareholder in VentureVillage). Since launching in 2010, Delivery Hero has achieved market leadership in Sweden, Finland, Poland and Austria, with over 400 employees worldwide. In Germany, the company operates as Lieferheld and in the UK it has a pivotal stake in the UK’s Hungry House. The company also recently launched in Korea as YoGiYo and has recently announced a further expansion into China. Delivery Hero’s main competitor in what has become a race for global acquisitions and market share – is London-based Just-Eat, which recently acquired UK firm Fillmybelly.com. The companies are just about neck-and-neck in the race right now, with Just-Eat only inches ahead due to its eight-year head start (it operates in 14 countries compared to Delivery Hero’s current 11). 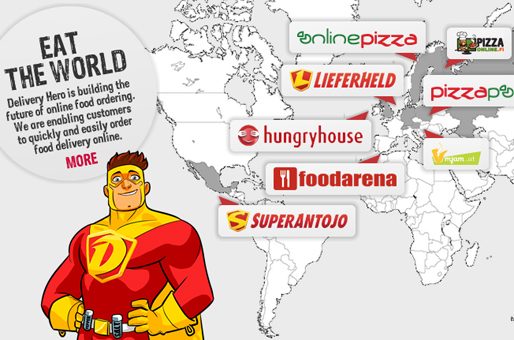 Delivery Hero’s acquisitions this year include Finnish Pizza-online.fi and the OnlinePizza Norden Group, opening up Scandinavian, Finnish and Polish markets. Focus will also be given to increasing its reach in the “important growth markets” of Germany, UK, Russia, Australia, Switzerland, South Korea and Mexico. In the first quarter of 2012, Delivery Hero orders apparently increased by 84 per cent, with an estimated annual marketplace revenue of more than €250m ($307m), making it “one of the fastest-growing marketplaces worldwide”. If you want some more facts to crunch, the company has released figures that state it has served up more than 32 million meals from the 21,000 restaurants across its global network so far.